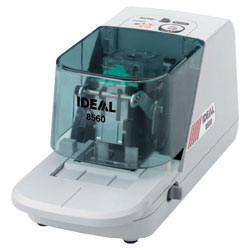 The Ideal 8560 provides you with comfortable, quick and effortless stapling. It is perfect in offices, large and small, by copiers and mailrooms. It staples 60-65 sheets at a time while hNEWing up to 5000 staples without reloading. . Patented flat stapling system. Virtually silent operation.